What we’ve decided to do for this year (again) is to dedicate the month of July to being more aware of Scottie Health – not that we’re not aware of the health issues surrounding scotties anyway – it’s uppermost in all of our minds. However, we want to focus, if we are able to, on the lighter side of the health issue and try and have a little bit of fun if we can. So, we’re asking everyone to wear their tartan for the whole of the month of July (if possible) and to send us your photos of your Scotties donning the plaid. Our Official Tartan is “Pride of Bannockburn and you can get that from Kinloch Anderson. There’s a store in the US, and one in the UK – not yet searched for other stores yet. But if you can’t get hold of it, and you want to wear our Official Tartan, let us know and we’ll post a snippet out to you. Don’t worry if you prefer to wear your own. Some of you may well be Scottish and have your very own Clan Tartan. Now that would be brilliant – there should be NO reason for you not to kit your beloved Scottie out in his/her own Clan Tartan either. My Scottie has been wearing his Tartan for the whole year – it’s now rather grimy as he adores wading through water and muddy puddles, so I think I should treat him to a new piece. So, there’s still plenty of time to get that tartan dusted down, and to start thinking where you might go and get those fabulous photos taken of your Scottie during the month of July 2014. 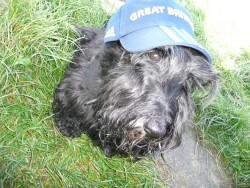 We’ll tell you when, how and where to post your Scottie Health Awareness photos to near the time!